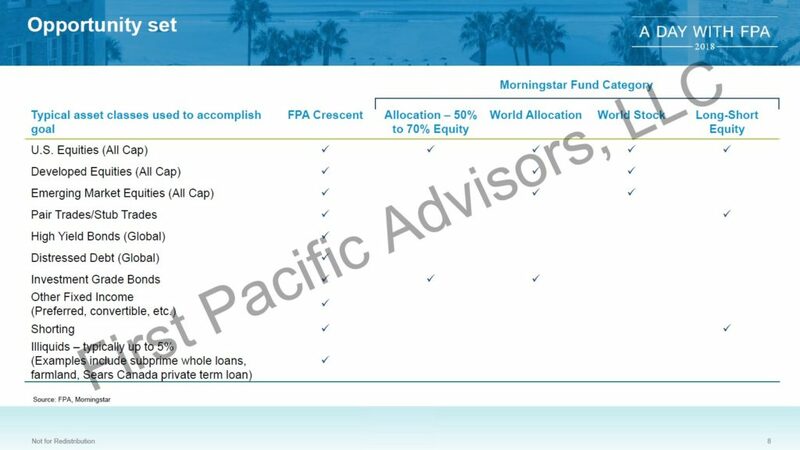 Prepared Remarks of the FPA Crescent Fund from the 2018 Investor Day. Without boundaries, the world is just too large, and we would spend too much time thinking about things that won’t make the portfolio money. There are more things that look good than are good. I like to think of setting strategy for the portfolio in terms of designing a golf course, with fairways and the rough to define the borders or boundaries. When it comes to our portfolio, we’ve designed our own little custom golf course, where our best opportunities lie in the center of the fairways. We may consider investments that fall in the rough, but they will generally be smaller positions -- and we’ll consider investing in nothing that falls out-of-bounds. Having a clear view of in- and out-of-bounds allows us to allocate our resources to their highest and best use. We want attractive risk/rewards. We want an understanding of what a company’s business model might look like in the future. That keeps us away from short product life-cycle companies and steers us towards companies that promise what we believe will be at least as good a business in the future. And to opportunities where the upside exceeds the downside. Our work hopefully leads us to the truth -- and we’re equally hopeful that others perceive a different outcome. In that, lies the opportunity. We arbitrage perception and reality. Rene Magritte, the Belgian surrealist artist, liked to challenge the perceptions of the observer. In Magritte’s view, this is not a pipe because you cannot smoke it. This illustrates the challenge of differentiating perception and reality. As Magritte might dispassionately explain it, this is merely an image of a pipe. Therefore, it’s just a work of art. We similarly prefer to deal in the objective, the factual. This has led, and will hopefully continue to lead, to equity-like rates of return over the long-term, while avoiding permanent impairments of capital along the way. We have a broad and flexible mandate that allows us to invest across asset classes and the capital structure in a variety of market caps, geographies and sectors. We are benchmark agnostic. Not only might we have a stake in an industry two times a given benchmark, but there are also times that we will have no exposure at all to certain sectors, no matter their benchmark weight. This has allowed us to win by not losing. Crescent’s opportunity set is unusually wide-ranging. We have far more tools at our disposal than other Morningstar Fund Categories that are typically considered broad, most of which do not invest in high-yield bonds, distressed debt, stub trades and periodic shorting or have exposure to less liquid securities. 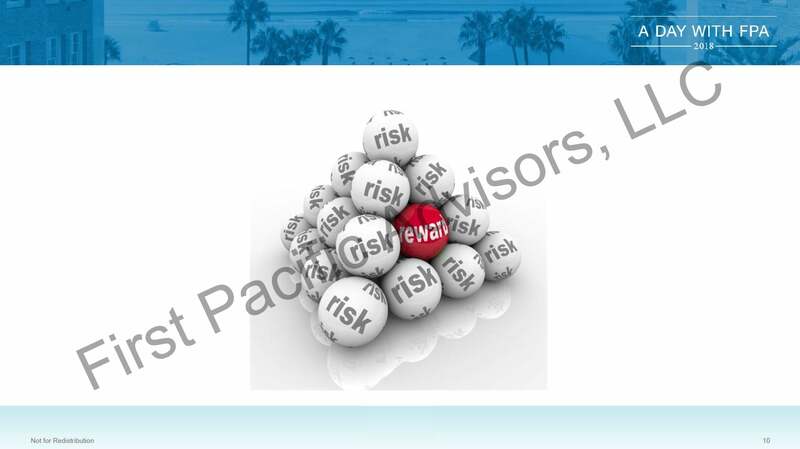 Our absolute return focus compels us to think carefully about the risk/reward proposition and how much potential might be in a unit of assumed risk. If the potential reward is dwarfed by too much risk, cash will build as a result – but as a byproduct of the bottom-up analysis of our research, not as a result of a top-down macro call. To avoid unfortunate and unprofitable misperceptions, we work to understand our companies better than most. Understanding a business, its industry, and what can go wrong requires time spent reading, reading, reading, and reading some more. We will never know everything, but we want to ask appropriate, thoughtful questions and not accept easy answers. What seems easy might prove problematic later, as was the case with this enthusiastic individual as she unexpectedly received the desired response for every question she asked. We patiently allow our investment process to unfold. It doesn’t happen overnight. It takes time to reach a conclusion on what we’d like to own. Once that’s done, we have to wait for the appropriate price. Each investment has its own biorhythm. And we sometimes wait quite some time for an investment to work out. 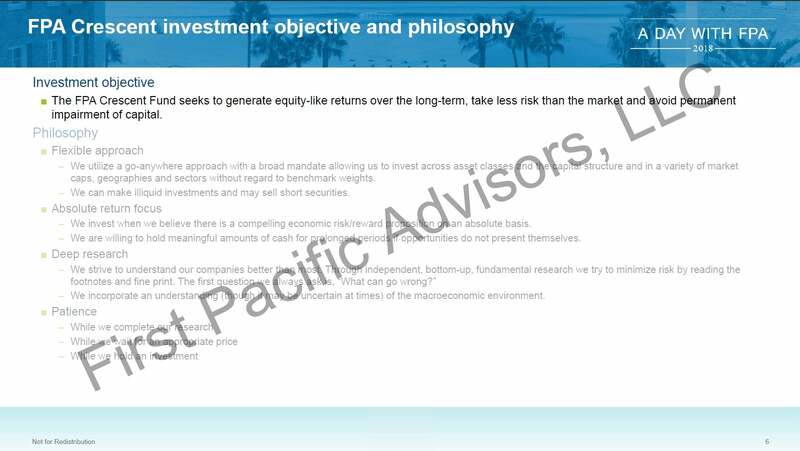 We have three broad categories for our equity investments. 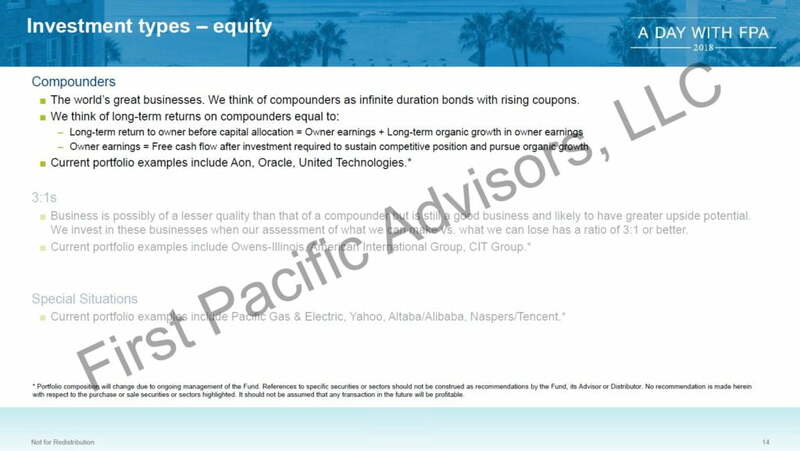 Compounders are those companies whose organic earnings we feel confident will be higher a decade hence. We think of them as infinite duration bonds with rising coupons. 3:1s are more commercial opportunities. Their stock is priced at a steep discount to its intrinsic value, but its moat isn’t likely as wide or as deep as the higher quality businesses of the Compounders. Thus, these investments are more likely to have greater upside potential than the Compounders. We call them 3:1s because we only invest in them when we can make at least three times what we believe we could lose. * Portfolio composition will change due to ongoing management of the Fund. References to specific securities or sectors should not be construed as recommendations by the Fund, its Advisor or Distributor. 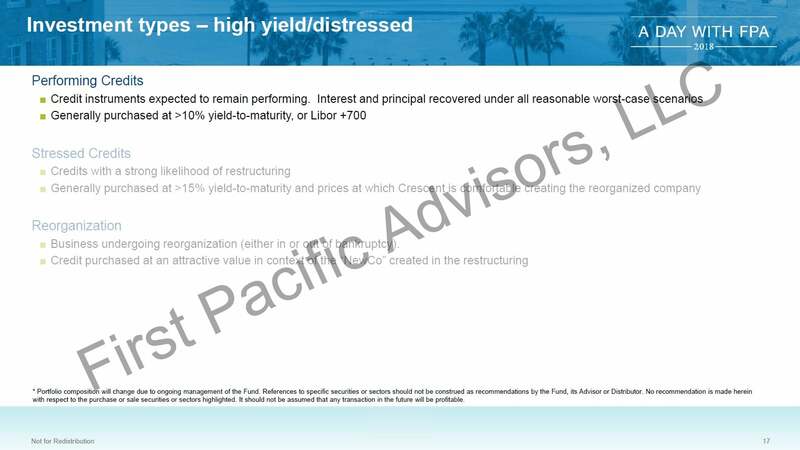 No recommendation is made herein with respect to the purchase or sale securities or sectors highlighted. It should not be assumed that any transaction in the future will be profitable. Special Situations are equity opportunities that don’t fall into either of the other two buckets, including our stub, or rump, trades.